Bjorn Andreasson's BA-7 major objectives were good performance, economy, unusual visibility and maneuverability. Fifteen hundred hours of work, one thousand dollars, and a used seventy-five horsepower Continental engine was the expenditure in the project. The project's catalyst, Bjorn Andreasson of Sweden, had been living and working in the USA. 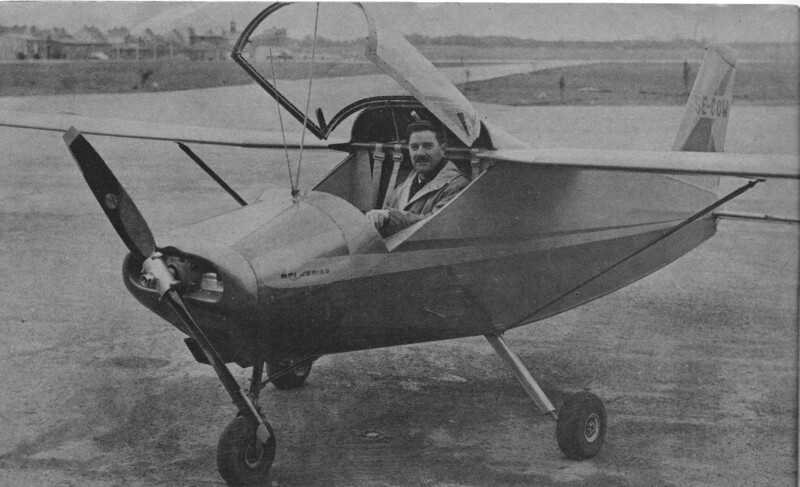 Andreasson first flew his 75hp BA-7 homebuilt prototype in 1958. The fuselage is a sheet metal box with exterior longerons and only three bulkheads. The horizontal tail is all-flying; the vertical tail has been changed to conventional fin-and-rudder combination and swept to enhance directional stability. The wings, using an airfoll only 8.5% thick, have an extruded spar at 30 percent, and a light rear spar at 75% chord. A heavy magnesium skin adds strength, and countersunk rivetting ensures smoothness. By undoing the rear spar bolts, the wings can be folded alongside the fuselage for easy towing or storage, an attractive feature. The visibility comes from the slight forward sweep of the wings, the occupants sitting forward of the spar. The one piece free blown canopy is hinged at the rear and held down by two latches, one of which is sufficient to hold it at maximum speeds. The main gear is built around two tapered steel rods, anchored to a box beam. The nose gear has a coil spring, is air damped, and is steared by the rudder pedals. Elevators and ailerons are actuated by a single centrally located stick; rudder pedals are dual, and a single hydraulic cylinder gives braking action to both wheels. The flap control incorporates a nonreversing mechanism that holds the flap in any selected position. The fuel supply is positioned over the center of gravity behind the pilot, and with the 75 horsepower engine in the prototype, the twenty US gallons provides six hundred miles range. A plastic tube is used to indicate the fuel level. Liftoff is at about sixty-five miles per hour, and an actual top speed of over 150 has been achieved. A more powerful engine is contemplated for the production version. Present approach speeds are on the order of 70-85, and touching speed axproximately 55 miles per hour. Andreasson was producing three copies of the MFI Junior, as it's been renamed, and with Malmo Flygindustri, Mahno, Sweden, a series of ten to test its market potential. A couple of years later Andreasson returned to Sweden where he joined up with theMakno Flygindustri company, later becoming head of the Aircraft Division of Malmo, a subsidiary of Saab Scania. While there he put together an improved version of his BA-7, powered by a flat-four engine of 100hp. Following its test flight, the BA-7 was renamed Malmo MFI-9 or just MFI to the team. Under the designation MFI-9 Junior, the first prototype Junior took to the air on 17 May 1961. 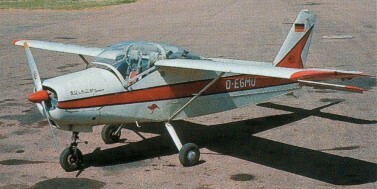 The basic MFI, of which 25 were produced by Malmo, had reasonably good beginnings and in 1962 Bolkow Apparatebau GmbH (Germany) became involved. Bolkow started producing the Bolkow B208 Junior as an expansion of the MFI-9 under licence to Malmo and by 1970 had produced 200 examples. Licensed production began in 1962 in Germany at the Bolkow factory as the Bo208 Junior. 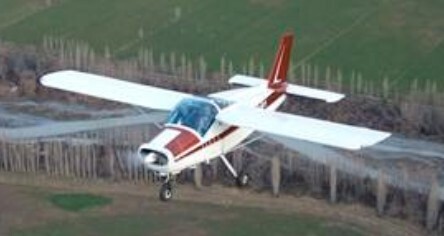 Two years later a new model, the Bo208C, emerged with the addition of electrically operated flaps, a trailing link nosewheel suspension and a former optional longspan wing as standard. Amongst other features, the Bolkow had tubular steel main gear well before Cessna adopted the concept. The Bo208 has only required three relatively minor mandatory modifications. Its only real problem came with the nosewheel - it was prone to falling off once the aircraft was airborne. The addition of the trailing link nosewheel suspension in the B model sorted that problem out. 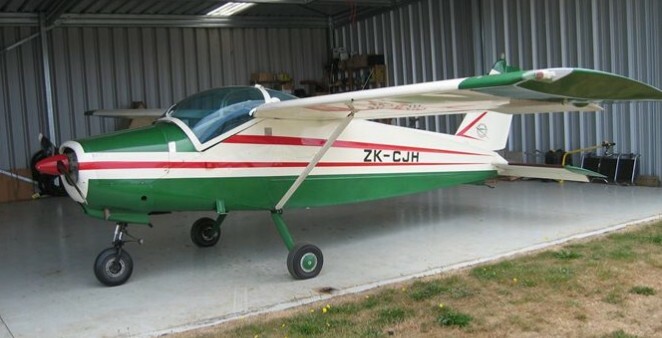 The Bolkow remained one of the fastest 100hp two seat light aircraft with a duration of four hours in the air (range 804.7km with maximum payload), cruis-ing at 120 mph. Aerobatic. 186 built in total. Some 210 Bolkows were built in the years following 1962, ceasing in 1970. Meanwhile, Malino had further developed the MFI-9 from which came the MFI-9B Trainer with an enlarged cabin. The 9B was purposely designed for the military as a basic trainer, although the type later became very useful in a ground attack role. Malmo, which built nearly 50 9Bs, was hoping that the Swedish Air Force would acquire its trainer, but that didn't eventuate. The MFI-9B was followed by a T-tailed version with provision for underwing stores, evolving to the MF-15 which was used a military trainer. About five rockettoting 9Bs saw service with the Biafran Air Force during the Biafra-Nigeria Civil War in 1969, when Biafra was fighting for its independence from the much larger country. The five 9Bs actually made up the air component of the BAF, along with a few inactive Harvards. Known as "Biafran Babies", the militarised 9Bs were flown by Swedish and BAF pilots and were up against the likes of the Nigerian Air Force's (NAF) MiG-17 jet fighters and the much bigger Ilyushin Il-28 twin-engine jet bombers. It is reported that the little 9Bs either severely damaged or totally wrecked numerous MiGs and three of the NAF's six Il-28 bombers during ground attack, hit-and-run operations. Other Nigerian targets attacked by the 9Bs included key airfields, armoured vehicles, troop and transport lines and oil depots. One 9B returned to base from a low-level sortie with 12 bullet holes in it. The 9B was also used in a 'MiniCOIN' role, a contraction of miniature counter-insurrection. At the end of seven months of flying combat missions, the BAF's strike force assets numbered two. Two MFI-9Bs had been shot down with the loss of their pilots and one had been damaged beyond repair. Engine: Continental O-200, 100 hp.